Even though no policeman was in sight, they displayed more bravado by setting three Sports Utility Vehicles which they drove to the banks, on fire. Before this, they had removed the number plates of the vehicles. A young lady was said to have led the over one hour attacks which bore semblance of the March 12 robbery in Lekki, Lagos. Four persons, including a teenage apprentice vulcaniser, simply identified as Rilwan, were injured by the robbers who fled through a jetty in the area. It was learnt that the bandits, numbering about 16 invaded the banks, located directly opposite the Ipakodo Police Division, at about 9am and started shooting indiscriminately. They were said to have opened fire at the police station to scare the officers, after which they proceeded with their operation. 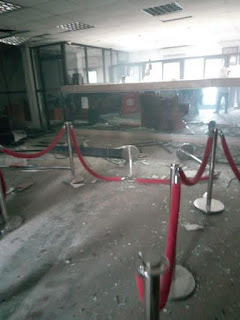 It was also learnt that the robbers used dynamite to shatter the rotor doors of the two banks to gain entrance and order members of staff and their customers to lie down. 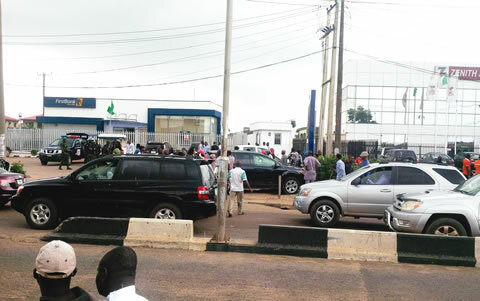 It was gathered that some of the gunmen were outside the banks firing into the air for over an hour. 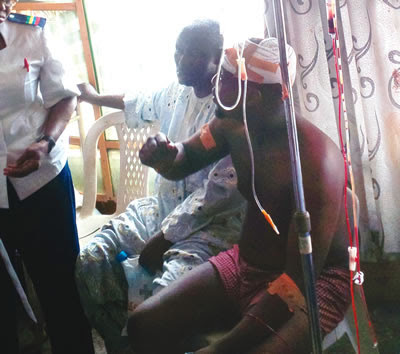 Some security operatives, comprising policemen and soldiers, arrived the area around 1.30pm after the robbers had fled. 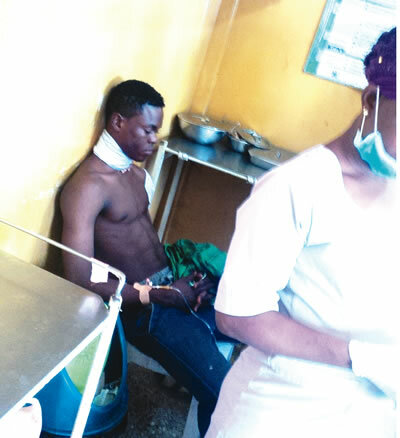 Punch correspondent, who visited the Ikorodu General Hospital, where the injured victims were taken to, met an employee of the Zenith Bank and a customer,who gave his name simply as Segun. 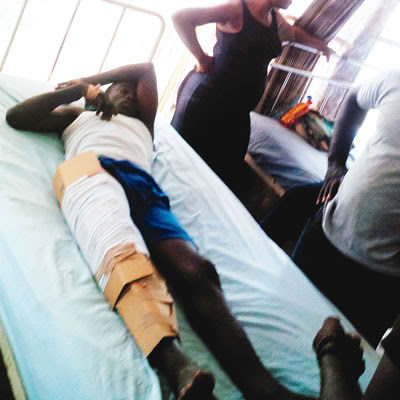 The banker (name withheld) and Segun sustained injuries after hitting their heads on glasses while the teenage vulcaniser and the fourth victim, an okada (motorcycle) rider, were hit by stray bullets. The bank official narrated the incident to sympathisers and our correspondent who found his way into the hospital. “They shouted, ‘open the door, open the door’, but none of us answered them. Suddenly, we heard an explosion and the glass went down. I was wounded by broken glasses. “One of them entered and when he saw about N20m that we had arranged to put inside our ATMs, he shouted, ‘Area, Zico see money. See money wey we dey look for.’ He started dancing. He pulled a lady among us and ordered her to pack the money inside the bags they brought. After packing the money, the robbers ordered her to lead them to the strong room. “I was at the First Bank at exactly 9am to use the ATM. It was my turn when we suddenly heard gunshots. I saw two of the robbers shooting directly at the police station and the policemen ran away. 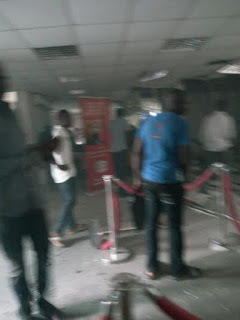 “Some gunmen came into the First Bank. A guy stood outside and two entered the bank. “Where I hid, I saw them carrying bags of money into the jetty. That short woman held the gun, while another guy took the money inside the jetty. 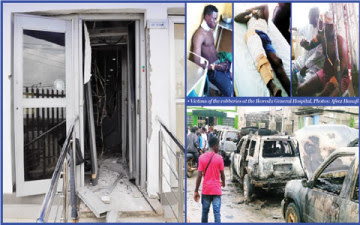 When they were about to escape, they removed the number plates of their three cars, poured fuel on them and shot at one of them, which erupted in flames.